Would your Great Falls, Virginia home be a sweet home without that welcome mat of uniform green spread out in front? For many, it would seem the answer is definitely no. The well-groomed lawn is a symbol of stability and prosperity that is deeply engrained in the suburban psyche. Even in regions that lack both precipitation and topsoil, homeowners will go to extremes to get their own patch of green. In this post we’ll look at the origins of the Great American lawn, the role it plays in modern landscape architecture and what academics are teaching the next generation of landscape architects and garden designers. Landscape architects use lawn grass as a ground cover base. That is, lawn grass is the lowest in the hierarchy of height. A familiar example of this function is in the front yard. The front lawn presents the house and leads the eye to its architecture. We also use lawn areas in the landscape to define edges near planting beds and hardscape features such as retaining walls. Grass steps are another example off how we use lawn grasses in a way that is both functional and aesthetic. On a practical level, lawn areas can help keep the landscape tidy. For example, when there is a heavy rain, mulch and soil may wash out of planting beds and pile up on a patio or walkway. If the debris washes out to a grassy border feature, it is less noticeable. So we use lawn grass as detailing to keep edges clean and hardscape clean. Landscape architect Justin Kromer says lawns are useful for creating transitions between designed areas at the back of a home and the property boundary: “We try to create an organic, soft transition—a natural border.” Kromer says the architects put just as much thought into the size and shape of a lawn as they put into designing a patio space. Lawn grasses have long been employed in landscape architecture as negative space to create definition around other landscape elements. Principal architect Howard Cohen tries to create balance in a landscape and uses lawn areas to fulfill the practical functions of leaving negative space around plants and trees, framing views and connecting one landscape area to another. He sometimes uses a lawn to throw focus to a distant point, or to showcase geometry in a landscape. The most obvious reason for lawns, Cohen says, is that they provide a function that most people want—a level back yard place for their kids to play. Lawns were a status symbol in 17th Century Europe. The only people who could afford them were the wealthy. Everyone else needed land for growing crops and feeding livestock. The lawn as we know it today was enthusiastically promoted by the American Garden Club after WWII. The Club would stage competitions and give awards to the most perfectly manicured lawns. But, it takes significant resources to maintain this kind of lawn. Colleen Vacelet, Adjunct Professor in Sustainable Design at University of Maryland, says this is part of the discussion when they talk about the idea of lawns in landscape architecture classes. There are two types of lawn grasses: warm season and cool season. The cool season grasses go brown in the summer heat. So a lot of the lawn seed is mixed to try to maintain green color all year round. That mixture is not something that occurs naturally. Vacelet says formal lawns of the type we might see in an English garden work well in that climate, but those grasses aren’t adapted well to the climate here. To get it to work, you need to apply fertilizer, herbicides and pesticides. And you need irrigation to support the lawn during dry spells. It is a big topic right now with storm water management and the effects of run off in the Chesapeake Watershed. If a property is large and the owners aren’t sure what they want to do with some of the acreage, Vacelet recommends planting a native meadow seed mix. That way there are no resources used and no need to mow regularly. You just let it go. Grass tends to grow poorly in a shady site. In this situation, Vacelet says she replaces grass with moss. This is an expensive installation, but once it’s done there’s no mowing, little maintenance–and most importantly no bald patches. Another alternative that she suggests is to replace a portion of your lawn with vegetable and herb gardens. And that, in an ironic way, brings us full circle. The lawn as a status symbol and a sign of wealth is replaced by an “enlightened” use of green space that brings us back into harmony with nature. 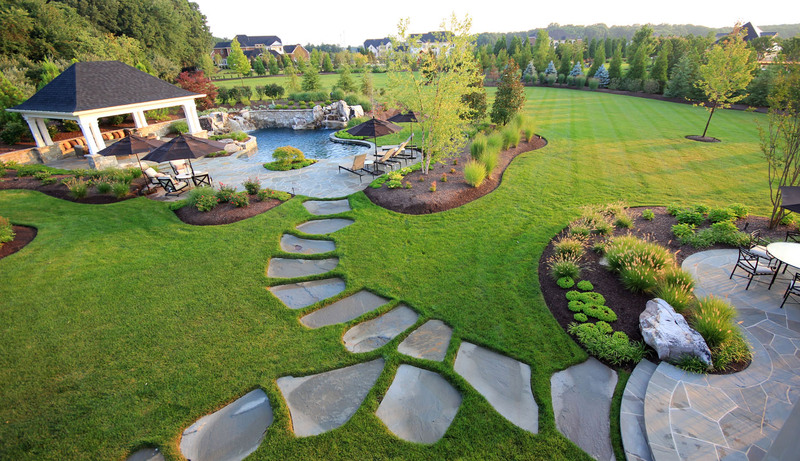 The lawn has long been used as a scenic element in landscape architecture. It’s aesthetic purpose is sound. And, on the practical side, a back yard playing field is a must for families with young children. So, although there are alternatives, we don’t expect to see the lawn concept going away. If you have questions about taking a low impact approach to lawn care, please feel free to contact one our Garden Management specialists. We’d be glad to help you find the best way to maintain your lawn and gardens.